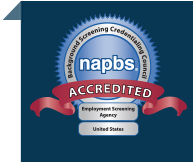 January 12, 2016 – The National Association of Professional Background Screeners (NAPBS®) Background Screening Credentialing Council (BSCC) announced today that Proforma Screening Solutions has successfully demonstrated compliance with the Background Screening Agency Accreditation Program (BSAAP) and will now be formally recognized as BSCC-Accredited. President of Proforma Screening Solutions, David Lowers, remarks, “We are extremely proud to have earned accreditation under the strict and rigorous guidelines set by the NAPBS. It has always been our commitment to follow the highest standards of quality across the critical dimensions required of the accreditation and this recognition serves to validate the great work of the managers and staff in our organization.” Proforma Screening Solutions is headquartered in Purcellville, Virginia, within the Washington D.C. metro area. Its nationwide client base consists of companies of all sizes and across a wide spectrum of industries. Founded in 2003 as a not-for-profit trade association, the National Association of Professional Background Screeners (NAPBS) represents the interests of more than 700 member companies around the world that offer tenant, employment and background screening. NAPBS provides relevant programs and training aimed at empowering members to better serve clients and maintain standards of excellence in the background screening industry, and presents a unified voice in the development of national, state and local regulations. For more information, visit http://www.napbs.com. Read the related article on the Employment Screening Blog.